This is a beautiful navy blue tray. It is a high shine locker and is actually a little smaller than I envisioned it. Make sure you measure it in advance. It still works for me and you can see from the photo that I was able to fit three items on the tray as I had planned. Bring modern glam style into your home with this hexagon shaped decorative accent tray with polished metal handles. Place this charming tray on your entrance console table as a trinket tray to hold your keys and mail as you come and go. This hexagon tray is spacious enough to hold documents or file folders on a home office desk. This tray can also be used as a decorative accent on an ottoman to hold your beverages or on your vanity for make up organization. Constructed of solid MDF with a glossy finish and polished metal handles, this tray is sturdy enough to serve your cocktails. The tray measures 18 inches wide, 18 inches deep, and stands 3.25 inches high. Bring a chic and glamorous decorative accent into your home with this beautiful modern tray. Decorative hexagon shaped contemporary tray with polished metal handles will be an elegant accent in your home. Tray is perfect for use on entryway table, vanity, ottoman, or even for serving drinks!. Outer display dimensions are 18 inches wide by 18 inches deep by 3.25 inches high. Decorative tray is constructed of sturdy MDF with glossy finish and polished metal handles. Modern design hexagon tray requires no assembly and is ready to use as a decorative tray in your home. Dimensions 18.0 In. X 18.0 In. X 3.3 In. I ordered the white tray. It looks perfect on my marble and gold coffee table. The shape is very unique and modern. Definitely recommend this one! 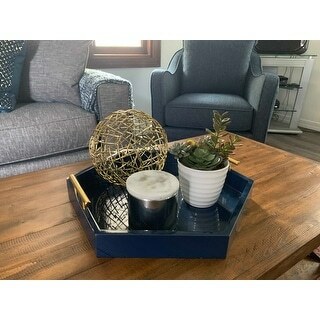 This tray is the perfect size for a coffee table, you can fill it with table decor or it's pretty enough to sit alone. The color is very vibrant and it is very well made. Definitely worth the money. This is such an elegant decorative try. I’m glad I picked the blue. It’s very classy and goes so well on my ottoman with a couple gold wine glasses. I would highly recommend it. This is a beautiful blue, heavy tray. It will look great in my kitchen for decoration. The hexagon shape makes it more interesting than other trays. The handles are a pretty gold color. Another great purchase from overstock! This is a beautiful, unique, well made tray that's versatile to use in any room. I purchased it to use as a bed tray and it compliments my bedroom decor. I highly recommend this tray. Bought two of these trays, one to put on each night stand. Really very pretty trays! I got the gold color. The gold with the mirrored bottom look beautiful! Perfect tray for nightstand to keep water bottles and such off of the wood. Also would look beautiful as a vanity tray on the dresser! I am very happy with these trays. I’m going to buy a couple more in a different color! Great buy!! This tray is beautiful and the gold accents make it pop. I love the shape, color and shiny finish. It is a perfect accent piece in our kitchen to add a burst of color. Absolutely love this beautiful, well constructed tray! Using in my bedroom as a mail tray, but could used in so many ways. Great value, thank you Overstock! Beautiful tray. The color is exactly as shown! The shape make it special and the shiny metal handles really sit it off and make it a show piece. Beautiful tray! Will be putting it on my new console that I ordered from here as well. Ties in well with my accent color (blue). More beautiful in person. 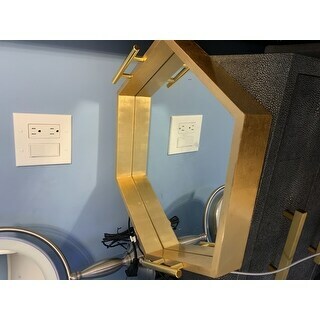 Purchased for a remodel of our study/sitting room and can’t wait to pull it altogether. Ordered the white one and it is even prettier in person. Absolutely love it and it goes great in my office on my ottoman. Wonderful and stunning deep color. The tray is stunning. It has a flawless finish and looks beautiful in my living room. "Will the pink be restocked?" Yes, this will be restocked but it may not be until December. I need a tray for the top of my dresser. The color and style is great. Nice modern touch and love the hexagon shape and handles. I thought it was super cute and will go with my decor. "Does the grey option have a mirror bottom?" They grey option does have a mirror bottom. "Will you be getting more navy ones in"